…Which is why I’m constantly running to Nature, and to these wonderful creatures. That reminder to JUST BE (or in my words, Simmer Down). And our winters provide a more varied opportunity for observing different happenstances of this simple state of being — the migrating birds make their residences in the area, even if it is temporary. A few Palm Warblers flit amid the trees; here, among a strand of young cypress. 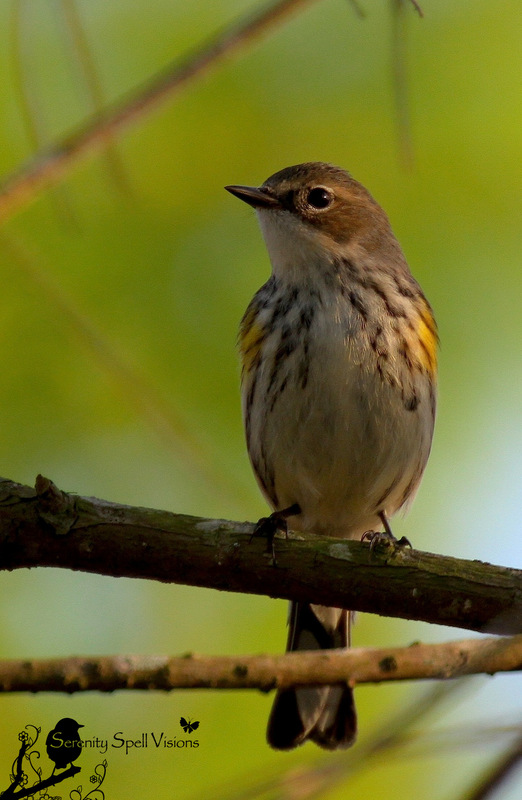 These tiny bright gems of songbirds — adorable little shocks of yellow in our swamp and wetlands — are easily missed if you’re in a rush, or aren’t fully aware. Palm Warblers are common winter residents in our marshy natural areas, migrating in the late fall to the southeastern U.S. and the Caribbean. 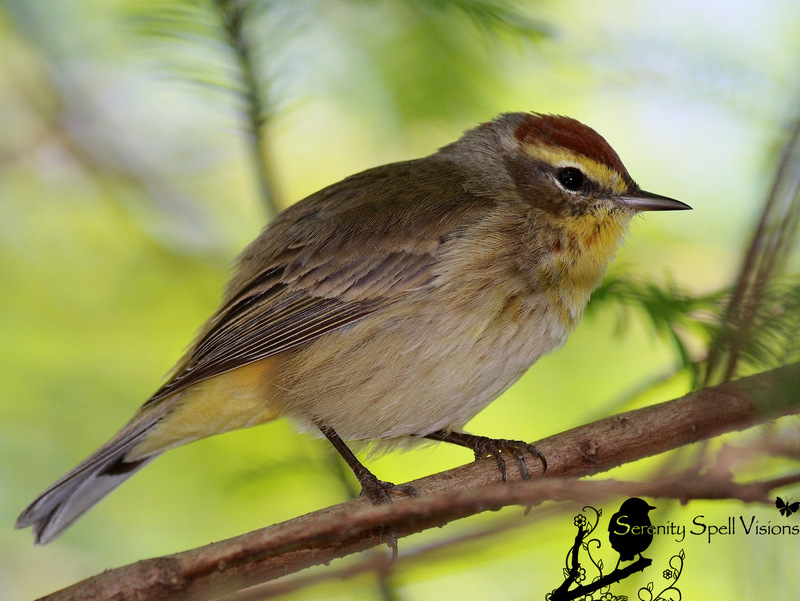 The species is comprised of two distinct sub-species, the Yellow Palm Warbler and the Western Palm Warbler. Those breeding in the eastern range are yellow underneath, while those inhabiting the western part of the range are duller in color, with whitish bellies. 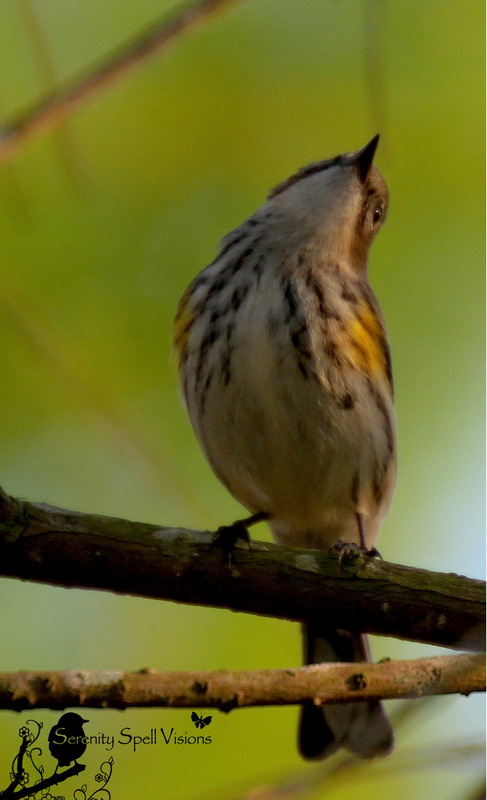 Palm Warblers primarily breed in wetland habitats — east of the Continental Divide, across Canada and the northeastern United States. A distinctive feature of Palm Warblers is tail wagging, or “pumping.” More than other warblers, this bird forages on the ground for insects and berries. Click here to listen to the delicate song of these sweet little songbirds! I love the quote. Very inspiring. I will find my song today. Isn’t that just wonderful? Such a great reminder to us all…. I don’t think that I have ever seen this species of warbler, but, if they’re anything like every other warbler, they’re darned hard to photograph. Excellent photos! …. I’m one of those generally in too much of a rush. In my defense, though, these critters are too fast for my ancient reflexes, and so small I need my reading glasses to see ’em. I love hearing them, though! They have the loveliest song! It’s hysterical trying to get shots of these guys — I’m whipping around like a lunatic, hauling that heavy 7D in ways I probably shouldn’t be… For a warbler. Do you see how I catch those lizards? AT REST! Nice images, especially like the first one. Beautiful pictures — I love birds. Spring is not here yet in the Rocky Mountains but you can see signs everywhere — it’s not far off with more birds showing up. The pictures are a sweet reminder of their song and presence. Thanks so much! It’s so wonderful to listen to them… These guys have such a sweet song. I can imagine in your area, that’s it’s especially wonderful to hear the birds return (well, more of them at least)! Yes they do have a sweet song and the doves have returned and we’re hearing them too. I just love the coming of Spring. Thank you! They’re such sweet little things… So very quick though! Darting here and there — I was thrilled to nab ’em! They really are! And their songs are just as sweet…. Such a sweetie, and yout photos are beautiful. They really are little sweeties!! And their songs match their appearance. Aw, thanks so very much! I was thrilled to snap them… They’re SO quick, these little guys! 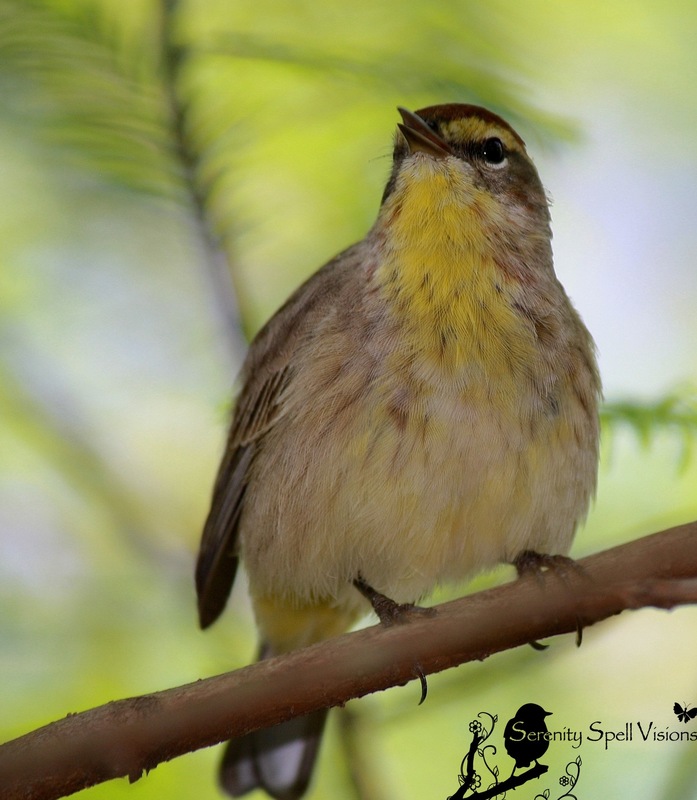 You actually have two different species of Warblers in your pictures…the first two are Palm Warblers and the last two are YellowRumped Warblers, (often called ButterButts). The Palms are coming into their breeding plummage….they’ll be gone soon….enjoy therm while you can…. AH, thanks so much for the clarification! I know some of the expert birders help me while I’m out there, and I’ve seen a few different warblers… Incredibly confusing. I know they’ll be leaving soon, though — so sad. I love to listen to them. I have a pair living in my tiny yard, since I’ve planted lots of native flora (berries and the like). Another little beauty living your neighbourhood!!!! Thank you for the introduction!!! I’m so happy to introduce them! And I’m thrilled to say that I actually have one or two living in my little yard as well, this year, since I’ve planted so many natives…. 🙂 They’re such sweet little things! Cute bird FeyGirl. Tough catching little guys like that. They really are adorable little guys! And you’re absolutely right — they’re amazingly FAST, crazed flyers! What marvellous portraits of these pretty birds! Thanks so much… I can’t get enough of these little guys! It’s sad they’ll be leaving me soon. I love the quote by Lou Holtz. Great shots too. Remarkably delicate lighting. Nature is lucky to have you for an advocate, FeyGirl. What pretty little birds. As much as I enjoy the water birds, songbirds are even higher on my list. There’s just something about hearing their song that makes me happy – part of the reason I try not to get irritated with the mockingbird who’s decided 4 a.m. is the time for full-throated song capable of waking up humans! And I followed the link to the Jesus lizard – how great. The story of them walking across the water reminded me of coots taking off. Such fun to watch! I do love our songbirds, even though many will be leaving soon. They’re the sweetest things…. Oh, how wonderful!! I can’t tell you how good that makes me feel — honestly!! How old is your son? I would LOVE to show you a project I have in the works (geared for children), but it’s still in the early submitting stages — it’s my dream to reach out just like this, for children! Thanks again, you’re truly the kindest. Wonderful photography – thanks so much. Thanks so much! I love these little guys…. Just adore them.